Let’s get this out of the way up front: Yes, Gabriel Mata has an amazing and very limber body, with muscles that most of the rest of us barely use, much less have visible on our own frames. And yes, the guy has a dazzling, super-friendly smile that will completely disarm you. He knows this. And he uses them as tools. In the least cynical but most deliberate way possible, to tell his story and get you to pay attention. His body is also a canvas. He knows how the sweat on his skin catches the light. He knows how the light casts shadows along his limbs and his torso and his face. He deploys this visual arsenal like a master. Like a guy who should be a lot more than just 27 years old. There’s a reason he gets awards for both his choreography and his performance. There’s a reason people were lining up to be donors to his current Fringe production, Dreaming. The guy knows his stuff. Gabriel Mata’s Fringe show last year, Out of the Shadows, was far and away my favorite Fringe show last year. I saw it three times. Not just for the beauty of the dance, but for the structure of the performance and the way it screwed with my head. People who saw his show last year were talking up Dreaming this year. And people who missed his show last year weren’t going to make the same mistake again. Someone in the latter category who saw the opening performance with us asked as we were walking out - “You saw his show last year. How does it compare to this one?” The first word out of Mom’s mouth was “Darker.” Which isn’t a bad thing, just very different. If any of us were expecting the same show out of Mata twice, we should have known better. Oh, there’s still a lot of humor and laughs in Dreaming. There’s still a lot of joy. But there’s something else going on as well, which is never far from the surface of the performance. It’s lurking in the dark, just offstage, just out of sight of the audience and the performer. Even though most of Dreaming takes place in a dreamscape of the performer’s mind, rather than waking reality - reality is always in the corner of his mind somewhere, ready to invade his dreams. Even my describing it that way makes it sound much more heavy-handed than it ever becomes in the performance itself. Mata has the lightest of touches in the way he tells his story through movement and light and shadow and sound. Watching this show for me was pulling my brain in two different directions at the same time. Most of me just wanted to allow myself to be carried along by the action of the piece, and for the most part that pull was the successful one. But repeatedly throughout the performance I was struck by just how smart it was, the way it was structured. The things Mata did, and didn’t do. I could see in my head the way any number of less skilled Fringe performers would bang us over the head with this message or that subject or the other visual or audio metaphor. They would do something here, whereas Mata would do it in a completely different place. The other Fringer didn’t have an incorrect instinct, but Mata thought about it and realized an even more effective way to do the same thing. Over, and over, and over again. I would want to just watch and not take notes, just be swept away, but the storytelling part of my brain kept going, “Damn, that’s good. Not everyone would do it that way. But that’s the better way to do it.” If I could write a play the way that Mata structures his Fringe show, damn, that’d be like printing money. That’d be cracking the code. It’s absolutely enthralling to watch artistry like that in action. Every choice he makes it incredibly precise. If you know Mata is an undocumented American, a participant in the former DACA policy, or Dreamer, you watch the whole show a little differently. Because he doesn’t choose to reveal that until very late in the action of Dreaming, and even then, he lays out the clues and let’s you put it together. Some people will know why he’s uneasy about someone being out there, watching him, waiting to pound on the door, from the start of the show. Others will only fully understand at that later moment, when it sounds as if he’s being questioned, or even detained. Dreaming works either way. In fact, it was only after the lights came up and we were filing out that Mom went, “Oh, Dreaming! Of course. How did I miss that other meaning until now?” Again, that’s partly deliberate. The information on the Fringe website doesn’t lean into that angle on the work at all. And I honestly don’t know how Mata got the level of precision he did with lighting, given the tight strictures on tech time that all Fringe shows have to live with. Because there’s a sequence later in the program where he’s at the back brick wall of the Southern Theater stage, in blue half light. And Mata’s movements were so specific. He knew just when his hands or his face or his back would enter bright light and fully reveal him, and then when he would retreat again into shadow. Really stunning detail work. Hats off to the tech crew for giving Dreaming such an evocative look that reinforced even the minutest moves. Beautiful stuff. I could go on (heck, I already have). Mata’s warm-up act in a bright orange sleeveless T-shirt that says Happy Hour on the front? He didn’t need to stretch or exercise in front of the audience. He could do that offstage. But he knows this is as much as we’ll get to commune with him as a “normal” person before the performance starts. He also wants us to know what he looks like, and what his body can do, and listen to some fun pop music, before the opening modern dance piece begins. He doesn’t acknowledge the audience, he’s re-establishing that fourth wall that he tore down last year, but we’re watching, and he knows it. There’s skin. There’s smiles. There’s laughs. There’s drag. There’s happy music. There’s darkness. There’s menace. Dreams both joyful and ominous. 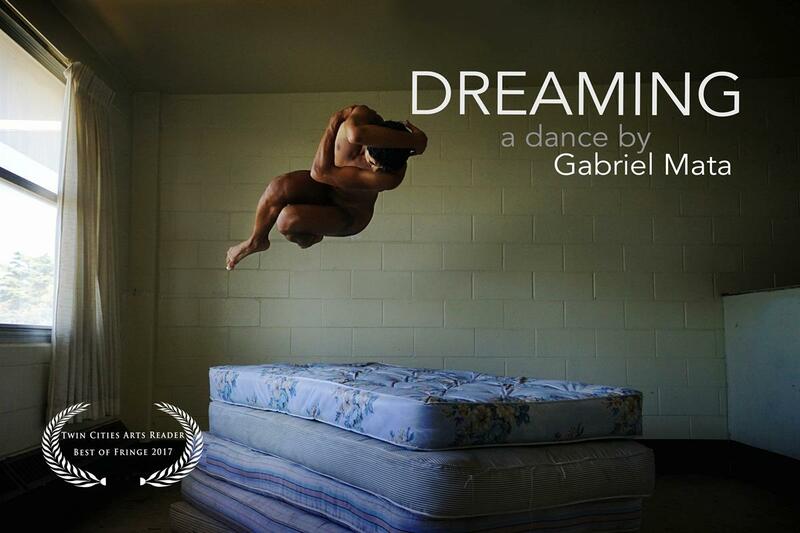 Even though it was just day one of the festival, I know Gabriel Mata’s Dreaming will be one of my favorite Fringe shows this year. If it doesn’t completely sell out and I can get a ticket, I’ll be seeing it again. Before he disappears.